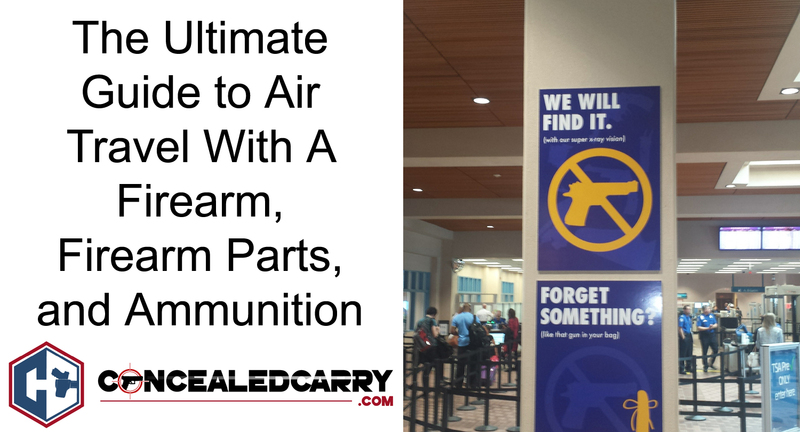 Below you'll find Everything You Need to Know About Air Travel With Firearms and Ammunition! I've checked a fair number of firearms in the last decade onto flights. In one year alone I boarded 99 planes and have personally visited all but 4 US states. To make this web page as efficient as possible for all readers, I'm providing a Table of Contents to allow you to jump directly to any specific topic or the video summary at the bottom. What Qualifies as A Secure / Locked Container? What Is The Deal With My Ammo? What Qualifies as A Firearm That Has to Be Checked? You may transport unloaded firearms in a locked hard-sided container as checked baggage only. Declare the firearm and/or ammunition to the airline when checking your bag at the ticket counter. The container must completely secure the firearm from being accessed. Locked cases that can be easily opened are not permitted. Be aware that the container the firearm was in when purchased may not adequately secure the firearm when it is transported in checked baggage. Like most legal questions the devil is often in the details so the rest of this article we will try to address the specific elements one by one and also add some cautionary thoughts about the tendency and ability for individual airports and airlines to have their own laws or policies above and beyond the TSA guidelines. Firearms AND ammunition may only be transported in checked luggage. That means they will never go through a security checkpoint with you. To try to take a firearm, firearm parts, or ammunition through a security checkpoint on your person or in carry-on luggage is illegal and can result in criminal charges. Each year thousands of firearms are discovered at security checkpoints in America. According to the TSA official blog, 4,239 firearms were discovered in carry-on luggage last year. Don't be one of those people who forget that your firearm is in your bag (One of the reasons we recommend having a dedicated range bag). Declare the firearm and/or ammunition to the airline when checking your bag at the ticket counter. You are required to inform the airline that you are checking a firearm by law EACH TIME you check the bag even if you are checking in for a return flight from which you previously declared it. This should be done at the ticket counter where you check in, check your bags, and often retrieve your boarding pass. If you checked in from a mobile app or your home computer you will still need to go to this counter (specific to your chosen airline) and check your bags. That is where you need to do your firearm declaration. My gut feeling is that you don't want to lead with something that informs them you have a gun as this could create an emotional response. That said you should know that I've never once had an airline employee so much as bat an eye at my firearm declaration. This is in part because I avoid airports where I know there is going to be a conflict (more on that below) but for the majority of airports in gun friendly states you should expect that they have a process in place and the airline employees are accustomed to following that process and will not get hysterical about the situation. Most airlines have a small paper tag that has a legal disclaimer they will ask you to read and sign. This tag is often then placed in the luggage with the firearm. Sometimes I've had airline employees ask to see the actual firearm itself and ask me to place the tag in direct contact with the firearm but those are the outliers. More often they just ask to see the “secure container” and ask me to put the paper tag near or on the container within the luggage itself. The airline employee takes the luggage with the secured firearm inside of it and places it with all the other checked bags behind the ticket counter. No big deal. The airport policy is such that an airport or airline employee takes your special bag to a specific TSA office or checkpoint and asks you to wait on standby while they scan and inspect your bag. Once complete the bag is taken to be added to the rest of the checked bags. The airport policy requires that you personally take the bag to an onsite TSA office or checkpoint and remain present while it is scanned and inspected. If you have ever experienced something different please let me know in the comments below. As defined by 49 CFR 1540.5 a loaded firearm has a live round of ammunition, or any component thereof, in the chamber or cylinder or in a magazine inserted in the firearm. So ensure your firearm is fully empty and devoid of any live ammunition in any place or form. The container must completely secure the firearm from being accessed. Locked cases that can be easily opened are not permitted. Be aware that the container the firearm was in when purchased may not adequately secure the firearm when it is transported in checked baggage. The container must completely secure the firearm from being accessed. If it can be easily forced open or if the firearm could somehow be accessed without opening the container then it doesn't fly. The container must be hard-sided. I've always taken this to mean (and have never had any information or experience to suggest otherwise) that any hard plastic or metal case qualifies as “hard-sided” but a soft case does not. If you could cut it open with a decent knife it probably doesn't qualify and will not fly. The container must be locked. Any type of lock can qualify including, digital keypads, biometric, key, and combination locks. Only the passenger should retain the key or combination to the lock unless TSA personnel request the key to open the firearm container to ensure compliance with TSA regulations. You may use any brand or type of lock to secure your firearm case, including TSA-recognized locks. You CAN but do not need to use a TSA Lock. I personally do not recommend using a TSA lock as I prefer to be the ONLY person able to access the firearm. I'm sure TSA employees are generally trustworthy but more than a few have been fired and criminally charged for stealing from passengers. In the case of a smaller secure container that is in a bag or other piece of luggage (as opposed to a rifle case that is its own piece of luggage), you can lock the bag itself but would need to use a TSA lock on the bag. People often ask me if the bag will then be marked, flagged, or treated/handled differently than other checked bags. The answer is no and frankly that is better. TSA and baggage handlers would be more tempted to steal your bag and gun if they knew which bags had guns. I personally use a steel lock box that is slim and doesn't take up much space. Here is a video where I compare the two models I recommend. Ammunition is prohibited in carry-on baggage, but may be transported in checked baggage. Firearm magazines and ammunition clips, whether loaded or empty, must be securely boxed or included within a hard-sided case containing an unloaded firearm. Small arms ammunition, including ammunition not exceeding .75 caliber and shotgun shells of any gauge, may be carried in the same hard-sided case as the firearm. So essentially if you have magazines, clips, or speed loaders they need to be within the SAME locked and secured container as your unloaded firearm. It doesn't matter if they are loaded or empty. That said a box of ammunition can be, but is not required to be, in that same locked container. It can be elsewhere in the checked luggage. Further, according to 49 CFR 175.10 the ammunition must be secured and packed in boxes or other packaging specifically designed to carry small amounts of ammunition. A sock full of loose rounds or even just one loose round at the bottom of your bag is a deal breaker and will not fly. All ammunition must be securely packed. Best to just keep the ammo in the container it came in when you bought it. Individual airlines may have limits on how much ammunition you can check (generally by the pound). The ATF controls what is defined as a firearm or not and there isn't a simple definition I can share here. On a case by case basis, the ATF points at something and says yes that is or no that is not a firearm. If it can fire a projectile with some sort of powder-based charge or propulsion I would say for our purposes you should assume it is a firearm and needs to be checked following all of these procedures. Also, note that I am not clear about the policy relating to certain firearm parts. The TSA does explicitly say that optics (scopes etc) are okay in carry-on bags but they are not specific about what gun parts would and would not be okay. I would always err on the side of caution and not try to carry on any firearm part. Now to be clear they do NOT say that replicas, training guns, or toy guns have to be declared, secured, and transported following all the above procedures we just reviewed but I would always err on the side of caution. Your airsoft, SIRT, laser gun, training gun, blue gun, water pistol, or other replicas should NEVER go in a carry-on and you should use your best judgment when deciding if it needs to be declared and/or secured in the checked luggage. Everything on this webpage is really a discussion about how to fly with a gun on domestic commercial flights in the US. A flight that originates in the US, requires going through a TSA security checkpoint and ends in the US. According to the TSA If you are traveling internationally with a firearm in checked baggage, please check the U.S. Customs and Border Protection website for information and requirements prior to travel. Based on my limited experience and research checking a handgun on your flight to Canada, Mexico or another country is probably a lot of difficult paperwork that may not even be approved. Long guns are generally easier to get approved especially in countries that have a thriving hunting industry. More information on that can be found here. Private air travel on private planes/jets is regulated differently than commercial travel. I know many people who have private jets and keep them in private hangers that they either lease or own. There are still federal regulations that relate to these planes but one doesn't go through a traditional TSA checkpoint for most of these flights and firearms are often allowed. All airlines and airports are required to comply with TSA guidelines but they can also have their own rules and regulations. Airports themselves are generally owned and operated by a city or county government. Even though the TSA may regulate the travel and have TSA personnel on site, the laws that apply at and in that airport will be determined and reflected based on the laws of that local jurisdiction. This means that the City of Denver makes the laws that matter at Denver International Airport … not Homeland Security. There are airports that have added enough red tape to the process of checking a firearm so as to make it virtually impossible to do legally. I am choosing at this time to not provide a comprehensive list as it can change and I run a serious risk of leaving several out. The takeaway is to always call/check with that airport and airline before arriving at the airport with your firearm in tow. Beware of Flight Changes and Rerouting. I had an incident in 2017 when my flight out of Manchester NH was cancelled and Delta decided to pay to send all the passengers via taxi down to Boston International. I had checked on the rules and laws for the airport in Manchester but knew enough about Boston to know that was going to be a problem. As the Delta employee tried to hand me my taxi voucher I said I could not fly out of Boston. When she asked why not I simply said: “I'm checking firearms.” She didn't bat an eye and immediately changed out the taxi voucher for a hotel voucher and put me on an outbound flight from Manchester the next morning. Back in 2015 (I think) I recall a news story in which a passenger flying from Florida to Pennsylvania was rerouted to a NYC airport for some reason. He had to exit the airport to stay in a hotel and when he returned the following day to check in for his flight out of NYC he was arrested when he tried to check his firearm the same way he had in Florida. So be sure to check before you fly. Hopefully this answered any questions you had on how to fly with a gun. Have you ever flown with a gun the right way before? The wrong way? Leave a comment below on the experience you had. Hiding Donations in Plain Sight: Do You Know What Your Favorite Company Does with The Money You Give Them? I flew from Ft Myers Fl to Cincinnati OH with my concealed carry pistol. This was my first time doing this. I read all the rules and it went fairly smooth. The one issue I had was that the lock was too big and you could open the case enough to stick a finger in. Everyone was very nice they direct me to a store in the airport that had smaller locks to solve the issue. I plan on taking my gun on future trips. A while back I had to take a trip so I approached the check-in counter. I simply asked for a declaration form, since you don’t want to raise an alarm. The agent knew exactly what I needed and pulling out of a drawer and handed it to me I then was escorted to a room behind the tellers with a conveyor for checked luggage and was asked to open it and show them the unloaded contents. I also had slide locked open. 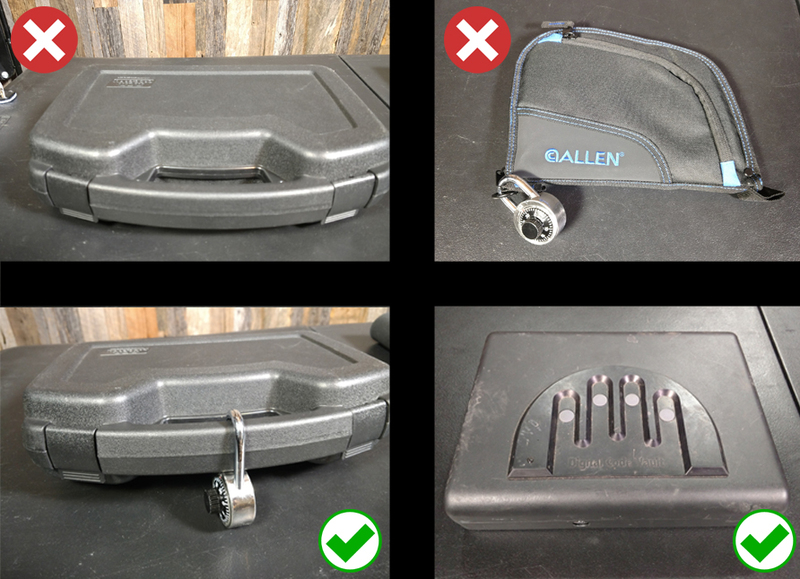 I was using a Pelican case since it’s a hard-sided case and had my own keyed locks on there. Then inside were all my personal contents and a regular handgun case unlocked. Ammo was in a small case separate. It’s also suggested even if you are not carrying a regular firearm, you can do the same manner but with a flare gun or maybe a BB gun because the regulations Define them as firearms, so they can be in a locked hard case. By using a Pelican case or any hard-sided suitcase you secure all of your personal belongings in there. Even though you’re only carrying a flare gun etc. Once, when going to Alaska from Los Angeles, I brought a gun as I was going to be in the backcountry. LAX gave me no issues leaving, nor did Anchorage give me any issues arriving. However, Anchorage (Alaska Airlines) were a huge pain leaving Alaska and then when I arrived in LAX, my gun case was just laying unattended by the oversized baggage. I think the key is to expect the unexpected. Flying back from a hunt in S. Dakota I was forced to buy a second lock for my rifle case.